Saint-Germain head into the new Ligue 1 season as the firm favourites to retain the title for a third successive year but there’s plenty of talent to see away from the French capital too with BT Sport covering much of the weekend action. With Gallic greats like David Ginola, Nicolas Anelka and Thierry Henry all cutting their cloth across the channel, Jack Beresford identifies the next five breakout stars from France. Linked with a summer move to Newcastle United, Lyon slapped a £16m price tag on Lacazette that should keep the likes of the Toon at bay for at least one more season. A breakthrough star for Lyon last term, Lacazette scored 15 Ligue 1 goals in 32 top-flight games and looked to be heading to the World Cup until Didier Deschamps decided to instead gamble on Loic Remy. 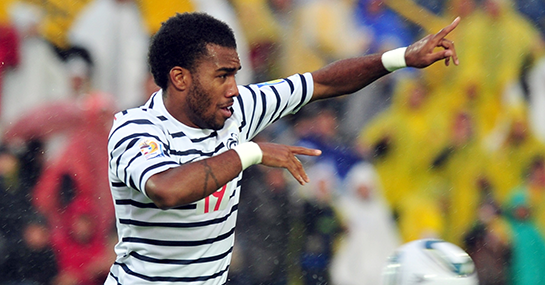 Another solid campaign could see the striker cement his place in Les Bleus squad. Born in the south-east commune of Fréjus to a single mother of Polish decent, Kurzawa is that most rare of things at mega-rich Monaco – a homegrown talent. The 21-year-old left-back has been on the books of the principality club since 2007, enjoying a breakthrough season last year during which he played 28 times for Monaco, scoring five times and providing three assists as he was named in the Ligue 1 UNFP Team of the Year. Signed for a bargain €700,000 from Le Mans last summer, the 19-year-old central midfielder was a revelation for Montpellier, taking to the role of central midfield enforcer with aplomb. Already capped by France at Under-19 and Under-21 level, Sanson’s impressive performances caught the eye of Daily Mirror journalist John Cross, who suggested the youngster could one day step out for Arsenal at the Emirates. Another impressive season here and who knows? Capped for France at four different levels of youth football, at 20-years-old Meïté is ready to make an impact for Lille following his €1.5m move from fallen French football giants Auxerre. Used mostly as a substitute last term, the midfielder’s versatility makes him a valuable asset with Meïté able to play centrally, on the left or further forward, this could be the season in which the youngster makes the big step up for Lille. The highest profile name on this list, following his €15m move from Lille to PSG, Digne nevertheless remains a diamond in the rough at just 21 years of age. Another left-back by trade, Digne’s 15 solid performances for the Parisiens last season were enough to earn him a place at the World Cup. Though he featured sparingly, this is shaping up to be a big year with the Meaux-born star ready to step out of Maxwell’s shadow at full back.